Providing a sublime year-round retreat to call home, this 2 double bed retreat offers a classical contemporary haven for couple-friendly and family-friendly stays. Its tastefully-chic interior blends effortlessly with homely comfort, ambient parquet flooring, sunny private terraces, a romantic private garden and a useful parking space; for a sophisticated and convenient holiday retreat for 4. Situated in the heart of Lugano city, guests are perfectly placed for reaching the vibrant lakeside centre; with all its tourist attractions, leisure activities, modern amenities and transport links to enjoy. Providing a serene ambience and a practical holiday layout, the spacious living area overlooks the garden and offers an inviting contemporary feel. The flexible 2 bed retreat is the ideal choice for two couples looking to stay or for a family group of 4. The residence is highly accessible, and benefits from lift access. Perfect for soaking up the endless summer months, the sunny private terraces are also complemented by a romantic private garden. Offering a stone-built alfresco dining area as well as a serene and shady sun-speckled setting, the charming garden enables’ guests to easily relax and read a book, or entertain in timeless fashion. A private parking space features to this spacious apartment retreat. Its’ convenient city centre location places guests within easy reach of Lugano’s main visitor highlights and a plethora of cosmopolitan amenities; for pure carefree holiday bliss! In the fashionable centre, designer shopping boulevards, museums, art galleries, casinos and nightclubs are all waiting to be enjoyed, alongside antique shops, traditional markets and timeless holiday activities. Popular attractions here include the Parco Civico, the Museo Civico di Belle Arti, Museo Cantonale d’Arte, the Museo Cantonale di Storia Naturale, the family-friendly Lido di Lugano, the tennis club and Cattedrale di San Lorenzo (all approximately within a 10 minute walk away). Lugano’s charming cafe-lined piazzas, idyllic lakeside promenade, panoramic vistas and scenic boat trips also provide an added dose of Italian-style romance too; for a truly unique, relaxed and dynamic Swiss lake city. Lugano is very well-serviced with ferry, bus, road and train and airport links; and the apartment itself is just an 8 minute drive from Lugano Airport. 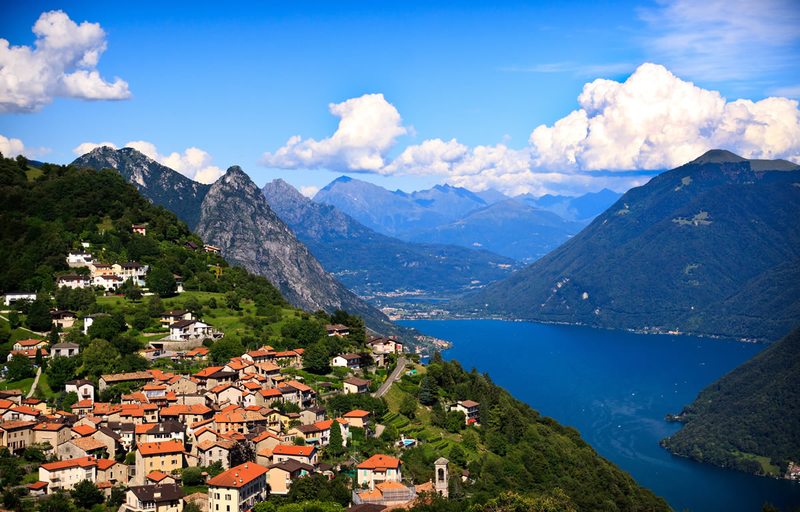 A stay in central Lugano also places guests within easy driving distance of its Golf club, the iconic Monte Bré, the ambient Olive Trail, the many tourist attractions of Ticino and the beautiful central lake of Lake Como.